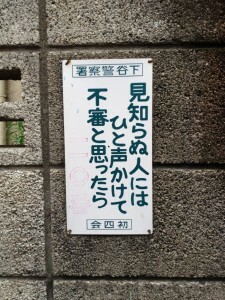 Signs like this are not uncommon, especially in the shita-machi (low city) parts of Tokyo, but they are usually more circumspect in the wording – most tend to be of the general ” ‘good morning’ and ‘good day’ make for a bright neighborhood!” type. I almost pulled out my camera and took a picture, but decided against it and continued on my way. However, as I walked further and further into the Yanaka area, I kept thinking about the sign and how it really captured not only the flavor of the neighborhood, but the essence of Old Tokyo as well. It was a feeling that I had become familar with, not simply because I had lived in a shita-machi neighborhood of Tokyo for five years, but also because of the following five years spent in a smaller “bed-town” on the outskirts of the city, where everybody knows everybody else and they look after each other. I regretted not taking the picture and vowed that the next time I was in the area, I would get the snap. What I would do with it was still undecided – perhaps a “only in Japan!” post on Facebook – but I knew that I wanted to have the image in my library. Fortunately, I was scheduled to go back a few days later to further scout the area with MD of the company so that we could improve the tour and thus offer better insight to how Tokyo lives and breathes. I decided to make it the subject of a post here at Orientation Tokyo because it *does* capture the essence of what it means to live in Tokyo and, on a larger scale, of what it means to live in Japan. People do look out for one another. There really is a sense of community – especially in the shita-machi parts of Tokyo; people know who I am (being the only blond haired, blue-eyed person in the area doesn’t hurt, but that’s beside the point) and take the time to greet me and make small talk. This happens at the local stores as well. But it is not just me, the foreigner, it is all of the other people in the neighborhood as well. They greet each other and talk and know what it going on in each other’s lives. Granted, it is as much a minus as it is a plus. My wife really dislikes having to participate in the local neighborhood government and its events, but the fact is that if she doesn’t, people will talk and we will become the subject of neighborhood gossip. That bothers her more than the obligation of having to go door to door and collect nighborhood dues, of having to serve tea and make signs at the nieghborhood hall and listen to the snippy comments from the old ladies there. On the other hand, these same people come and give us fresh vegetables from their gardens when they are in season, and when they get back from trips to the countryside, we are sure to receive a small gift of a local delicacy. The same thing happens everyday in the small neighborhoods that make up Tokyo – people looking out for others in their community and taking the time to make those people a part of their lives, even if it is a small one. And that is what makes Tokyo such a great city to live (and visit!) in – a short walk, often only a minute or two, from your train/subway station, and you are transported from one of the largest cities in the world into a small “town” where everyone knows your name and the pace of life slows down.